Muscular cows sporting well-worn collars trot into a makeshift arena, where they snort and pummel the ground into roils of dust, bells clanging. When the head-butting begins, she who turns away loses. “Huit, evacuée!”—Number eight, you’re out! 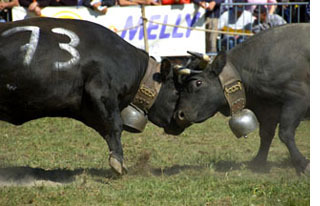 The Combats des Reines (fights of the queens), held in Switzerland’s Valais canton since the 1920s, showcases the combative character of the Héréns breed. In a country known for soft-eyed bovines, the “macho” cows of the Valais fight without provocation, to establish hierarchy within the herd. Each spring these not-so-gentle damsels compete to lead the herd to summer pastures, going head-to-head in six categories according to weight and age. In the arena, a cow chooses whether to stay and fight. Most do, but to the frustration of breeders, some decide to seek out a grass snack instead. Cantonal syndicats stage preliminary contests commanding audiences of around 5,000, with twice that number for the Aproz final. The gore-free contests are held in meadows astride the steep alpine ridges that ribbon the canton. There, combatants named Prunella and Surplice are cheered on as soda and beer vendors do brisk business. Local bands or, in an über-Swiss touch, alp horns, provide music to accompany rustic lunches on trestle tables. Cows chew their cud, their heavy chain tethers the only indication that they’d as happily get into a scuffle. Later, cows which outlasted their opponents earlier in the day fight to move ahead in the competition. 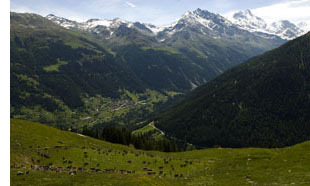 Although not uniquely Swiss—Héréns/Eringer tournaments are held in Austria, France and Italy—these contests offer opportunities to observe an alpine tradition in startlingly picturesque settings. Rodeo-style duels are also held in Martigny’s Roman amphitheater during the annual Foire du Valais exposition each October.